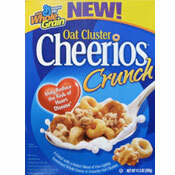 The complete name of this new cereal is Oat Cluster Cheerios Crunch and it's described on the box as being "A cereal with a perfect blend of five lightly sweetened whole grains and crunchy oat clusters." The five grains are oats, wheat, corn, rice and barley. Naturally, you would expect this new Cheerios to have more of a health-food taste than it's namesake. That isn't the case. The dounut-shaped cereal pieces mingle together to create a flavor more complex than original Cheerios. The oat-like taste that makes original Cheerios so distinctive is still present in this cereal, but because it's offset by other flavors, it actually tastes less like something that's good for you. General Mills has got some nerve referring to their tiny, straggling, busted-up pieces of stuck-together oatmeal as "oat clusters". The so-called "clusters" are too few and too small to be included in the name of this cereal. Honest advertising and promotion would require that the pieces be called "Oat Bits" or "Oat Sparkles". They have also taken enormous liberty with the word "crunch". The dinky "oat clusters" add little to no crunch to this cereal. In Oats For Breakfast 101, you learn that smaller oat pieces are responsible for for quick cooking instant oatmeal. The reason is that smaller pieces absorb liquid faster. So it should be different with milk in a bowl of cereal? It's not. If you want any respectable crunch out of this cereal, you had better eat it fast. If you ignore the powerful, misleading words on the box, this is a decent cereal. It's an interesting variation on an old favorite. While the "oat clusters" may be in short supply, they do impact the overall flavor, lending a sort of oatmeal-cookie-esque sweetness. I may have felt deceived, but I did enjoy the bowl I had for breakfast this morning. Will I buy it again? No... not until the box says "Now With Bigger Oat Clusters" so I can try the cereal I was promised in the first place. What do you think of Cheerios Crunch? I love this cereal and have been looking for it at all the local grocery stores. Please bring it back or at least let us purchase online. Great cereal. Please bring back crunchy Cheerios. Best cereal I have ever eaten. 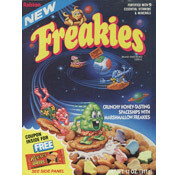 I loved this cereal and am so disappointed that Cheerios has quit making it! Please bring it back! This is my favorite kind of Cheerios. I've been searching all stores in my area for the past two weeks and can't find any of the shelves. What has happened? There must be ten others flavors on the shelf! Also, always wondered why it didn't come in the large size? This is a good cereal for people that want a sweet cereal but still want a decently healthy cereal. My daughters and I love this healthy cereal. If the crunch clusters could be separately packaged within the box, it would be much, much better. The crunch clusters now all go the bottom of the box. In a separate container, the eater could sprinkle as much as needed or wanted without waiting until the end of the box when most of the clusters are at the bottom. Umm... why does the guy who was standing in the commercial look like Rupert Grint from the Harry Potter movies? Man... he's super adorable. I absolutely love this cereal! I have started eating it every morning, and I find that the Oat Clusters give it a sweet kick. I have bought several boxes and have had no problems with Oat Clusters being small. I also put a banana on the cereal to add even more fiber. This is one of the best and healthiest cereals I have had. This cereal is the best cereal. Sweet and delectable and a good breakfast with getting your fiber with the oat clusters! Yum, yum! I've had three boxes of the cereal and the first one had little oat clusters but the second and third had much bigger clusters, so maybe the clusters broke apart during shipping or something. I personally LOVE the flavor and will continue to buy it - I actually crave it every morning! Nothing special about this cereal. I like the Kashi-Go Lean Crunch. Now there's a cereal! Personally, I love the cereal and I hope that it isn't here just temporary. I want it to be around. That is our problem now why obesity is so high people always want more and more. We have to learn to thank God for what we have and take better care of ourselves. Even in what we eat. If the cherrios only have a small portion of granola oats in it, then I think it was for a reason. We all need to eat healthier anyway so I think the cereal has just enough. If you want more just add some more granola. Just don't complain, but be thankful that it is available to us. Some people don''t have a choice of what they can or cannot eat. If they get a chance to eat at all. BE THANKFUL, DON'T COMPLAIN. What the heck do y'all expect? It's mass-produced cereal, not fine dining. I really like the stuff. It's got a nice sweetness and cinnamon flavor, yet is not too high on added sugars and still retains the fiber of the regular Cheerios. It's a tasty cereal that is relatively good for you. Yeah! the commercial drives me insane. The cereal is so-so. Like the other reviewer said, better to add granola to your regular cheerios. You are SOOOO right! I wish I read this BEFORE I bought the cereal. I shook and shook the box thinking the clusters had settled to the bottom. I took the bag out of the box and saw hardly any kind of cluster... just like you said, just little UNCRUNCHY sparkles. I see that general mills has it hard to find their customer service link, and that they have no reference to the Oat Cluster cereal yet. You are better mixing regular Cheerios with a granola cereal! PLEASE remove that ad from TV with people makeing awful noises chewing and snorting...nothing turns my stomach faster... cereal looks good but that turned me off. I agree with you, Mr Breakfast - those oat clusters are barely even there. The whole time I was hoping when I got to the end of the box I'd find a treasure of oat clusters had settled to the bottom. Wrong! It's tasty - and a nice switch from the original - but the clusters have to be bigger!